Find this Podcast “What’s Not Covered with Microsoft FastTrack with Kirk Liemohn” on the ThreeWill Soundcloud, Stitcher, and iTunes. Danny Ryan: Hello, and welcome to the Two Bald Brothers and a Microphone podcast. This is your host Danny Ryan and I am here with Kirk Liemohn. How are you doing Kirk? Danny Ryan: Excellent. And we are going- this is our second go at this right? The first one didn’t work so well. Danny Ryan: Technical, did the, the power went out. Were you here in the office? Danny Ryan: Power went out, it was just not meant to happen. All of a sudden everything went blank. I was like, “Kirk are you still there?” But, here we are, we’re both sitting in the same office so if the power goes out here again, I guess we’ll just deal with it then. We want to cover what Fast Track doesn’t cover. So let’s start off at the 50,000 foot level. 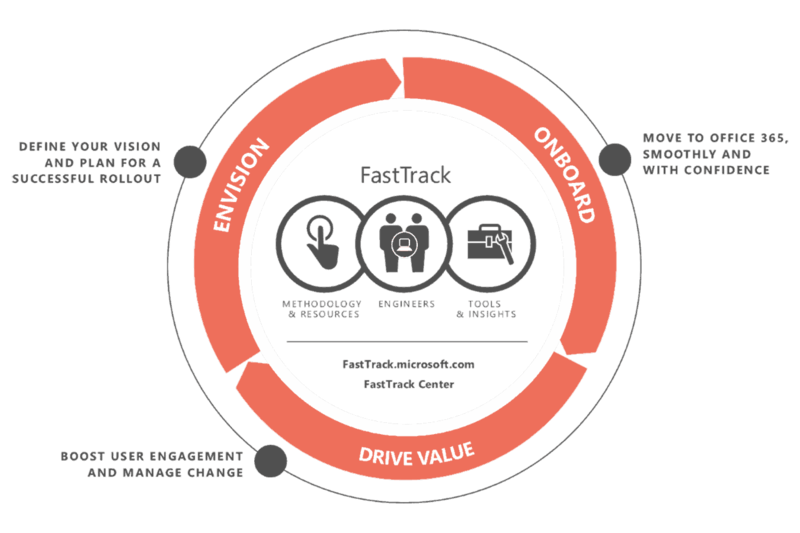 What is Fast Track? Kirk Liemohn: Okay. Fast Track is a Microsoft program. You can learn more about it at fasttrack.microsoft.com. It covers, really they’re programmed to get people onto the cloud to get them also onto 365 and Dynamics. In our case, we’re talking more about SharePoint. And also they have a set of, it’s a larger program, but they have a set of services to help customers migrate from their on-prem version of SharePoint. [crosstalk 00:01:34] Either SharePoint 2010 or 2013. Although, I think they only advertise 2013 to Office 365 or to SharePoint online. Kirk Liemohn: Probably, [crosstalk 00:01:50] but I don’t know if there’s a URL for all that. Danny Ryan: Okay. But Fast Track covers a lot of different Microsoft products. But the one we primarily focus in on is getting to SharePoint online primarily. Kirk Liemohn: Yeah I know they do Exchange as well and it’s a free service they provide but they get to choose who gets to use it I guess. And you have to qualify. For a while they had an open qualification for … they were allowing people to request to get involved in this and I don’t know if they closed it off or exactly how you coordinate making it happen. But I know they’re still doing them. But I would recommend it, especially for SharePoint migration type thing. It really can help. Danny Ryan: So we’ve created a service that basically compliments, that augments what Microsoft does. So as part of that, I think one of the key things that folks need to understand is, is what it does cover and what it doesn’t cover. So in this conversation wanted just to talk through with you what it does cover and doesn’t cover. So tell me more about … start diving into what Fast Track is, what the phases are and those types of things with Fast Track. Kirk Liemohn: Yeah, they’ll start out with [inaudible 00:03:08] way of communicating to the companies and they’ll go through PowerPoint decks. They’ll describe their process and in the end, their process is basically going to … let me silence my phone…[inaudible 00:03:28] their process is going to cover what they call a wave one, which is really kind of their trial set of site collections. They’re going to move for you. But before that happens, you have to be prepared for it. So there’s some things you have to do to be ready. But they’re going to cover moving the bits after you provide a content database backup for them and then mapping of which site collections you want to move and where you want them to go, as well as, a mapping of users and groups. And then they’ll migrate that over a series of … they have a prep phase, a migration phase, a UAT phase, all within each wave. So it’s these rolling phases if you will within each wave. They’ll do that for wave one and they want to kind of be full speed ahead on another set of waves, maybe five more waves. And they’ll do a maintenance window where you can update user and group mappings and some other things and then they’ll do another set of waves. It all depends on how much content you have. The one we did recently, I think we had, let’s see … I don’t know, we had probably 11 waves I think. Danny Ryan: And is the wave … how is it decided what goes in that? Is it a matter of content that you’re moving over? The number of site collections? What is it? Kirk Liemohn: Yeah, there’s a limit on both. I believe it’s 500 GB per wave and I think there’s a limit on the number of site collections per wave as well. I remember that. The first wave has to be smaller. I think they want that to be maybe 100 GB at the most just to kind of get things going and kind of make sure both sides are ready to work with each other. Danny Ryan: And who is the point of contact on the Microsoft- How does this work logistically between the two? Because we’re like a third party involved … there’s a client and then Microsoft’s Fast Track services and then I imagine there’s a point of contact from each company that’s coordinating all of this? Kirk Liemohn: Yeah that’s right. So, once you really get rolling, we’ll start having daily calls. At least several times a week we’ll have calls. The Fast Track team will provide someone that you’re communicating with and that person coordinates the rest of their team, which really can include I think upwards of 100 individuals. So it’s not a small team. They all need accounts unless you’re looking to have shared accounts to get in and do some work. They do this just so they can spread this across all the work that they do. So it’s a lot of people. Danny Ryan: So on the Fast Track team at Microsoft, has a lot of people who are … these are migration engineers who are? Kirk Liemohn: They’ll be running the tool which is the Logics content matrix. I know that’s one tool that they use. I think that may be the only one but I’ve heard them say they might use others in certain situations. The migration engineers will use that tool. Danny Ryan: So is there a tool that you run that tells you these sites won’t move? How do you determine what they can do and what they can’t do? Kirk Liemohn: Fast Track covers … You have to give them basically a spreadsheet for each wave and you have to know the predetermined time that’s two weeks before the wave starts or a week before prep. And you’re basically saying here’s the site collections that are in scope for this wave and then they’ll make sure that it meets the content database size requirements … I’m sorry site collection size requirements. And then you’ll have to upload every content database that those site collections are in by a certain date. Just doing that is kind of hard. You need to manage that process and that’s something they won’t really help you with. They’ll just kind of say, “Alright, what’s next?” It will provide you a SMAT tool output which is a tool you can download from Microsoft. It’s free. It gives you migration analysis of what you have on your on-prem environment. It covers 2010 and 2013, different versions for each. They’ll also roll up that information into multiple sheets in a spreadsheet. They’ll roll that in because it’s a lot of content that the tool creates, a lot of information. It’ll tell you what your inventory is, as much as you have. But other things like running work flows, what site collections have running work flows and how many at that time. So they’ll try and tell you things that the Fast Track doesn’t cover because it doesn’t cover migrating running work flows. No tool will. They will cover migrating the work flow definitions and associations but not the actual running work flows and that’s just because it’s really not supported, going to Office 365 to move something there, to move a running work flow there. So the SMAT output will tell you several things that it doesn’t do. There’s some things that it doesn’t tell you about the [inaudible 00:08:58] doesn’t cover. That’s one of the ways we kind of augmented the process. We wrote some scripts to try and understand things like, specifically one or two. If you have any specific search settings on the site collection, it doesn’t move that and they’ll report those as one example. Danny Ryan: Okay, what do you do in the cases where you have a site that’s got a running work flow? How do you handle those sites and when you find something that they can’t migrate? Are you migrating those sites? Or what happens? Kirk Liemohn: Yeah so running work flows, you can’t do it at all. So you could really go through a really manual process of trying to set up the work flows on the target environment in Office 365 to be like they were when they were migrated. But we don’t do that either. We work with … the companies we work with on this, we’ll create a set of migration policies, which is a document and we work them to refine it. We have a base one of those, a template that defines all the things that basically, SMAT sorry, Fast Track doesn’t cover. So I mentioned running work flows. Fast Track also doesn’t cover migrating lists or library support of 5000 items. They just won’t do that. They also will only cover a certain number of versions of items. I think that’s five, I forget now. So then if you … the SMAT will tell you that, or sometimes our scripts have to tell us a little bit more. We’ll get that information and we’ll say, “Oh wait, you know what? We just migrated this site and it had two large lists. Lists were larger than 5000 items. The Fast Track team did not migrate that list.” We know that and then we have some post-processing we need to do. In our case, we were migrating that for them. We’re working with our client to migrate that for them using, in our case, I think we used Share Gate. But we could have used Logics as well or any of the others. It was just something that they won’t cover so we kind of augmented the process to work with them on the communications side. We’re kind of communicating, this is the process it’s going to take. If you have a large list it’s not going to go right away. You should know that. You’re going to go through a UAT period where that large list isn’t there and then we’re going to push it out after that UAT period because Fast Track team doesn’t want us migrating things until UAT is signed off and over. So they’ll do the incremental after that as well. Right after the incremental, which happens over the weekend for each wave, then we’ll go in and do the large lists. We’ll also, in our case, we looked at work flows and worked with definitions that failed the copy and we would go in and special case those and see if we can move them over. A lot of times it’s because they were using things that just weren’t supported in the target environment. So we couldn’t migrate them as well. So we have policies that would kind of document these things are not covered and these need to be read by the site owners so that they knew what was coming. When you’re working with large companies, they’re going to have a large number of site collections and they can’t manage hand holding each one of these. So the site owners have to come up with what’s their plan going to be. If that plan involves “Oh I’ve got to get some developers involved to make this happen”, well then hopefully you give them enough time. You’d start preparing that early so that they know. We can tell them from the SMAT report. We can say, “Hey, looks like you’ve got some large lists out there. Maybe we don’t support moving that. Fast Track doesn’t, but we could. Or you’ve got a large number of workflows, it’s a good chance those work flows may not migrate for one reason or another. Info Path forms that they’ve [inaudible 00:13:02] custom database is not going to work. Lots of things like that. Danny Ryan: Was the in state that you moved everything over to SharePoint online or was it a hybrid environment? Kirk Liemohn: For this client it was a hybrid. We would go through the SMAT analysis and there was already some site collections the client knew they didn’t want to go to SharePoint online. They have a way of designating site collections that were confidential. So they made an early decision. Those wouldn’t go to SharePoint online. Later they changed their minds and they did go to SharePoint online. But there were others that were more complex. They knew they had custom code, maybe a farm solution and custom web parts and those are not going to be supported going over. So the choice was let’s just get them over to SharePoint 2016 in our case. So we’re working with them actually currently to migrate applications over to SharePoint 2016. Danny Ryan: I would imagine some of these large company environments, there might be a lot of third party stuff as well. Did you run into that? Kirk Liemohn: Yeah they had some but they were pretty clean when it came to that. They had some, but not much. Danny Ryan: Okay, that seems like it catches a lot of folks. Kirk Liemohn: Yeah definitely. They did a pretty good job of limiting their users in certain ways that I think was beneficial. So they weren’t allowed to … Fast Track will cover this, but they weren’t allowed to do [inaudible 00:14:40] permissions everywhere. They did have one custom set of permissions, which custom permissions Fast Track kind of says they don’t support. But the tooling does underneath the covers for the most part. But they just know there’s caveats with that so they say they don’t support it and we’ve got to kind of follow up and make sure that it’s working properly. Danny Ryan: Anything else that is out there or things that people should just be aware of that aren’t moved by Fast Track team? Danny Ryan: What about publishing sites? Kirk Liemohn: They do move over but I believe that was definitely a focus of ours, I think. Now in our case, the client did not have many of these at all; had very few. They were cut down. But I believe there can be problems, but I do believe they move over. There can be a lot of things. There can be things like folder depth. So how deep do your files go in the document library in terms of folders and how’s that work in the target environment. An example, is if you use Office Web apps like Exchange online to open up a file, it might have a problem if the folder depth is too much whereas, just downloading the file would work. There’s some weird issues that can pop up like that and we try to communicate that. Kirk Liemohn: For us, nothing directly. They were doing Exchange online through the Fast Track program as well at the same time. That was supposed to happen kind of first and it didn’t completely happen first. They were finishing up while we were starting. So we coordinated with them. We would have regular meetings but it really wasn’t a problem for us. Danny Ryan: What did the team look like? How was it structured as far as sort of commenting on this earlier … which was you know there’s sort of a point of contact in each of the companies, but, from our side, did you run this like a typical two week sprint? Was this sort of a usual project or sort of classify a little bit about the process and a little bit about the team necessary for this. Kirk Liemohn: Right so any migration is not going to be too causal. It’s got a more rigid process, but you do have to be actual because things come up. Like the client says, “Oh, we want all of these confidential sites now to go to Office 365 because the security team just approved it.” But we would try to have a regular cadence of two weeks, sort of like two week sprints where we kind of reviewed things. But we would also have weekly calls and weekly meetings as well as daily. But weekly ones with Microsoft or the daily ones, those would kind of go over, where are we within a wave. “Oh okay, wave two is in UAT and wave three is in migration and … let’s see, no that would be backwards. No, that’s right. And wave four is in prep and then wave five is we’ve got to upload our content database this week and provide our mappings. Kirk Liemohn: Yeah so from our side with our team, our team was relatively small from ThreeWill. It was primarily Pete Skelly and myself. We both played several roles. On the client side we would have project manager, we had an individual that was in charge of touching SharePoint more directly and that person might be setting the site collections to read-only through a script that we wrote. So they’d just have to say, “Oh run that for wave five” and it would do it for all site collections for wave five. There would be another individual that might run, who would have been the same individual, but another individual in their case that ran the large list copies or work flow definitions that failed to copy and work with them on that and kind of manage the whole thing. We manage most of … we help provide the structure for most of the communications so the clients communications team was involved as well. They would approve the messages we came up with and they could tweak what we want to say. We’d send out mail merge emails to the site collection owners at various times throughout the process, tell them what’s going on. They’d have of course the site to go to hosted in SharePoint online. We had documentation of what they could do and we had our policies already announced to them and they could review and they could see kind of what issues they had. You’ve got a couple of large lists, you’ve got some Info Path forms that might be a problem. Things of that nature. Danny Ryan: Part of the reason why I think we’re doing lots of migrations is it’s a good thing for an outside partner to help out with. Primarily, cause you learn a lot of things doing it the first time. Then reapplying it together. Your internal folks, why should they spend so much time and energy doing something that they’re only going to do once. So I think the reason why I think people see value out of being an outside partner, I could see how as well it brings value where we’re involved in coordinating with the client and with Microsoft and we’re handling a lot of those things. I’m also hearing from you that there’s also what we would call something that would be like an accelerator which is, here’s all of the scripts and things like this that in addition, that will keep us out of trouble and make sure the migration goes successfully. What would you say are the main benefits of bringing us on to this project and having us help out with augmenting what Fast Track does? Kirk Liemohn: Well I think the main benefit is we kind of know what to expect and we can cover some corner cases that we wouldn’t have thought of. So the Fast Track team and Microsoft, they have their own process. They’re going to tell you about that process and they’ll try and guide you through it. But they’re just not going to tell you certain things that maybe they don’t know about that you’re going to come up against. They’ll kind of say, “Okay here’s the things we don’t cover just so you know that and maybe that means you need to have a process around how you’re going to communicate that.” Just lots of things. We found that with this client that as we’re sending out these messages that “Hey your wave’s about to go” or we would send an email weeks in advance and they’d come back and say “Oh, you know what, these site collections are out of scope, we don’t care about them anymore. They don’t need to be moved. They should be deleted.” I’m sure all companies are going to find that. So you’ve got a lot of site collections. Managing that is kind of tough. You could be bringing like 30 of those at once. You’ve got to go tweak some master list somewhere. We had scripts that would take the SMAT output, populate a SharePoint list so we could then set properties on. Then we had scripts that we then mass update that list with say all of the site collections that are now out of scope because we’ve been getting communication from the various site owners that they can be removed from migration. So I think the main one is really just the knowledge of the process and how we think it needs to be augmented by someone other than the Fast Track team because the Fast Track will not cover. Then obviously we do bring some assets to the table. There’s several lists we create that helps us manage the process and then there’s about a dozen powershell scripts that we’ve got out there that do things that I’ve already mentioned. Other things like your wave start dates may change. We need those to be updated. In our case … well for Fast Track, they want to know who the content owner and technical owner is because part of their process they’re going to send out communications to them and that means you’ve got to know who your site owners are at least at a minimum. So you’ve got to have a process for figuring that out. Sometimes those people have left the company and it’s not necessarily all that simple. So you want to have a way to manage that. So we’ve got ways of doing that. I think on the support side that we’ve got a way of … Fast Track team does have an issues list that they use but then it’s going to be out of scope after UAT is done. If the team doesn’t respond about a particular site collection by the end of UAT, then it’s assumed accepted. So if there are issues after that, what are you going to do? So you need to have a way of managing that process. You want to be able to still support your users after they’ve migrated and Microsoft has kind of washed their hands clean of that wave. You still want to support them. Danny Ryan: And we have … what I like about this project is at the end of it, nothing happened. There wasn’t a lot of drama. Kirk Liemohn: No I think it was about 26 weeks, not counting some earlier prep stuff. And that’s because … and I’ve got something here that shows me 29 weeks. There’s going to be … wave one is not staggered. It has four or five weeks that it takes to go through … you’ve got to upload your migration database. Microsoft is going to have a prep week, a migration week, a UAT week. They’re going to have a post-processing week. So all of that is happening. So that’s at least five weeks right there. Most of that happens without wave two starting because wave one is kind of … they want to treat that as a special wave. It’s almost like a pilot. It’s a smaller amount of content. Then you’re going to go through your other waves, which ours staggered. When wave two is in migration, wave three is in prep and wave four, you’re uploading content databases to Microsoft. Then they use Asher for that by the way. After you do maybe the next five waves, they’re going to want a maintenance window. They’re going to work with you when those maintenance windows should be and it might be around things like holidays and stuff like that too. In our case we were migrating through the Fall of last year. So Thanksgiving, Christmas holiday all came up. We did plan for one of those breaks I believe to be during Christmas basically, Christmas and New Years. Maintenance window provides another gap. You kind of have to flush the queue of all these waves that are going through. Then you’ll start up the next set of waves. Then they have to flush the queue again. You may go through another set but before you do My Sites, if you’re going to migrate My Sites, that’s kind of all on it’s own as well. Kind of like that first wave is all [inaudible 00:28:04] and My Sites are done at the end all on their own. Danny Ryan: It’s interesting because I think because of our [inaudible 00:28:19] background, you guys are able to do things like the 12 set of scripts and things like that that if we were pure infrastructure where we just didn’t have that in our toolbox, we would get stuck in certain situations and really know how to handle that. It’s interesting as well because in order for us to do what we want to do for these large clients, which is build on the cloud, they’ve got to be in the cloud. So for us, I think there’s just … it’s been a logical progression for us to, in order for us to get them over, we need to help them get over to that and then sort of like the next step in the evolution of what we’re doing as a business. I think we’re getting to the point where now that they’re in the cloud, we can start talking about configuring and then customizing and then building more things like line of business solutions and stuff like that, but if they’ve never moved over, then it’s difficult for us to talk about those things. With our [inaudible 00:30:25] background, we’re able to do that. We did find someone that had a script that we modified so that helped. Without that then basically site owners kind of just find out later on that “Oh all of a sudden this whole group of users can’t access my stuff and I didn’t know about it.” It’s good to help with the communication. Danny Ryan: One last thing and it’s something you need to think about. Kirk Liemohn: Alright, I’m ready. Danny Ryan: If you had to think of two things that you wish that you knew before this project, two of the most important things that you wish you knew before this project started out or things that were picked up … can you think of two? Let me ask you that. Kirk Liemohn: The project went really smoothly. We had to react several times and I’m sure there were times we were frustrated based on kind of the situation but I can’t remember one of those times. I mean it went smoothly. This client did have some things locked down and that helped them out. The less you have locked down for the move, potentially the more issues you’re going to have. I can’t think of anything. I think they did a good job of kind of deciding, “Hey these things are going to have problems. Let’s move them on prem. We’re going to do that as a separate project, which is under way now.” That’s a whole set of different circumstances. That’s a whole set of different tasks and operations you do. Danny Ryan: Was this more of like a pure IT function? You said content owners were involved but was there an executive sponsor of this or was this more of a IT modernization of infrastructure type of thing? Kirk Liemohn: Yeah I’m sure there was an executive sponsor. We just didn’t deal with that individual. So I know they got approval for when and the whole timing I think changed a little bit at one point because once we said, “Hey these are some issues that you’re going to run into with the exchange migration dates changing.” I think that might have changed our dates a little bit. The executive sponsor I believe was involved with those decisions but for the most part we were working with a small team from the client to make it all happen along with a large team from Microsoft. Danny Ryan: Cool. This has been awesome. I think one of the things I would like to do maybe as a follow up is get a better understanding of what those scripts are, what they do, maybe write this up like put an accelerator page out on our website and describe what those things are cause I think that’s valuable for folks to know. It sounds like we’ve created a process sort of wrapped around the whole Fast Track process for managing all of this. We did get to the finished line and that client’s very happy. So how can we do something similar for our next client who needs similar type of services. Kirk Liemohn: Right and we have some similar processes we used in this and some of the scripts even are used in our other migrations that don’t involve Fast Track. Kirk Liemohn: Yeah so I mean we always want to have an inventory list. We like it to be in SharePoint that has basically a role per site collection and then it has additional information about that. And we have scripts that interact with that. We have scripts that will hold SMAT data and push that in there. If you’re a small company, it’s likely that Microsoft is not going to accept you into the Fast Track program. If you’re a big one, it’s likely they will. We use some of the same scripts to kind of manage the process and then we’ve … outside of Fast Track, we’ve got ways of orchestrating the tooling both in Logics and Share Gate to some degree. Mostly not Logics but I think we’re moving forward on Share Gate as well. We did that for Fast Track for the most part. Now we could have used a little bit of that with this last project but since … basically we would use those tools to migrate large lists and work flows, work flow definitions that failed to go, and since that number was relatively small, we did that by hand, we configured it by hand. Danny Ryan: Nice. You’d get a kick out of this. Pete and I are working on sort of a modernizing or digital workplace here at ThreeWill. So we have somewhere between 300 and 400 site collections. So he did an inventory of those and yesterday I was going through and you know how much we’re using teams so we’re moving more towards a model of using teams. We have sites where some of it, the content didn’t move over. So we’re talking about sort of how do we move some of that content over and deleting things, cleaning up. Pete’s going to … believe it or not, we’re going to have a governance plan inside of ThreeWill where we don’t create [inaudible 00:35:51] sites on our ThreeWill tenant. Go create your own [inaudible 00:35:55] sites and try to keep it clean. Put some control over our environment. I know that’s a crazy thing. We went through and we’re doing things like … Pete’s going to go through the whole modernization of some of those sites. That has a new modern interface to it. Really try to … we’re organizing all of the account sites so that there’ll be an accounts hub and then we’re organizing the department sites so that our homepage will be a hub for our department sites, just sort of organizing things inside of ThreeWill. It’s good. We’ve got the new digital workplace workshop that we’re running with folks on taking some of his materials and we’re applying it internally. Hopefully that’ll help him as he goes out and delivers that workshop or whoever delivers the workshop. Danny Ryan: Cool. Very cool. Well if you’re listening to this and you’re obviously interested in Fast Track and you may be looking at this as something that your organization is going to do, number one, I hope this was insightful, hearing that someone has done it and done it successfully and made the move over. Sounds like a pretty large client. If you see enough value in having us come in and help coordinate it and some of the things that we discussed in this podcast, obviously reach out to us through the contact us page and we can set up a follow up conversation with Kirk where we can go into more detail about maybe a particular subject that you want to go through. We’d love to do this with more clients. It sounds like something that they were really happy with and something where sort of the partner brings in the solution. So we bring in the last little bit, that last 20% that puts you over the edge. Why do … migrations are a one time thing? Why learn all this stuff yourself so that you never have to apply it again? Bring in our knowledge to help you with this move. So reach out to us through the contact us page on our website and I’d love to follow up with you on this. Thank you Kirk for doing this. Congratulations on a successful project with this and hopefully we can find some more clients who want to do something similar with this. Thanks everybody for listening and have a wonderful day. Take care. Bye bye.